Next I need to set the back straps, which are sewn in a very interesting way. 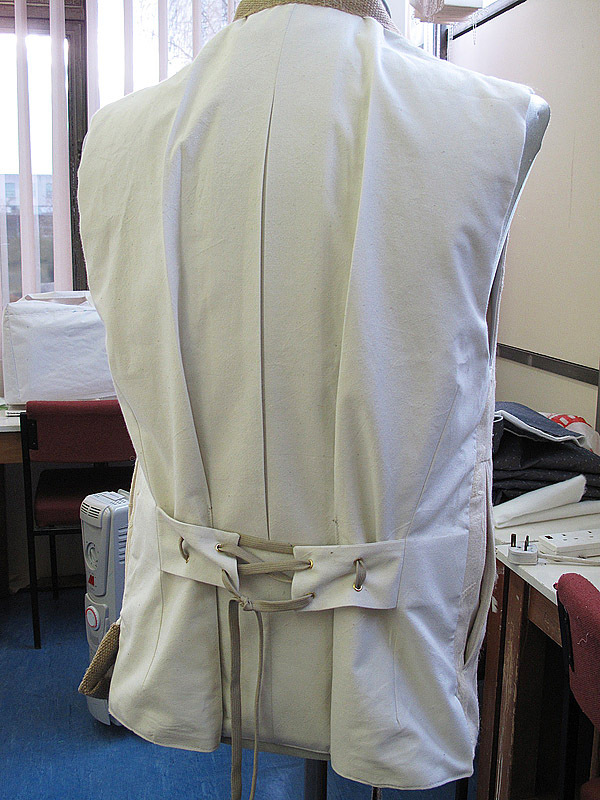 Either side of the vent, again just like a Tennant Coat, are darts to shape the lower back. It is through these that the straps are attached. So first I cut a slit just high enough for the straps; then with the straps pinned carefully in place, I sew the darts, catching the straps as I go; after pressing the darts flat, the raw end of the strap is stay-stitched to the edge of the back to make sure it sits in the right place when come to assemble the refer of the waistcoat. 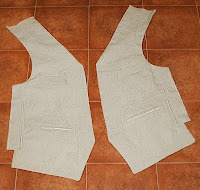 Identical matching darts are sewn in the lining, though without any strapping. 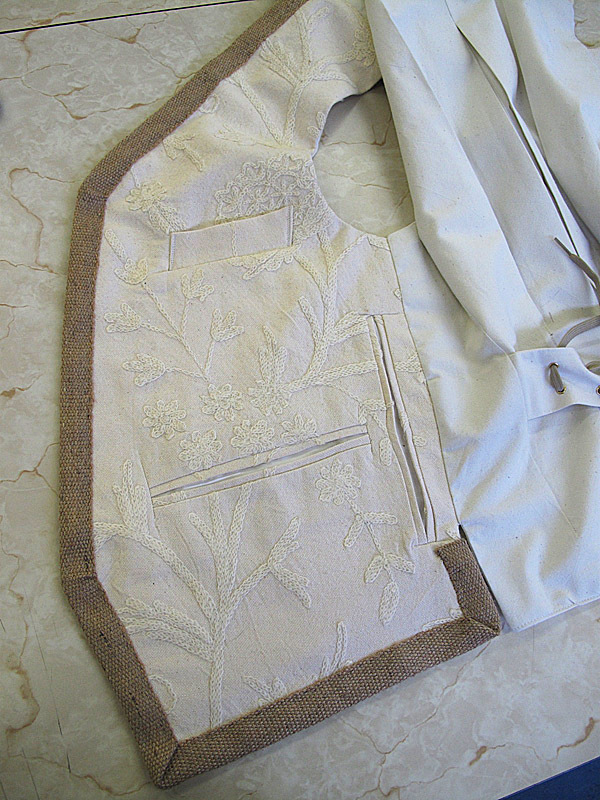 The waistcoat is now pretty much ready for assembly. 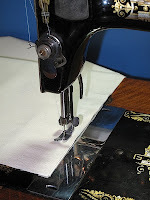 Im the first to admit that I can be a bit of a lazy stitcher, and prefer to do as much as possible on my trusty 27K Singer seeing machine, so any method that avoids hand-stitching is very welcome! Almost every commercial pattern for waistcoats (or shirts for that matter) tell you to hand slip-stitch the last seam to close off the garment. 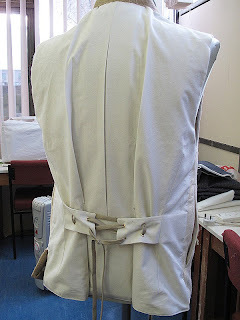 In a commercial setting, ie shop bought clothes, if every item had to be finished in this way the cost of budget garments would have to be higher, so there must be a way of machine finishing to get the same result. Luckily there is, and my college tutor had given me a handout for just such a method only a few weeks ago as she thought it might come in handy - how right she was! The method is so fiendishly clever and simple, it come under the heading of Trade Secret, so I’m afraid it’s gonna remain just that and I’m not going to reveal how it's done here. Sorry. Suffice to say it works, is quick and simple once you get your mind round it, and produces a professional result (see left). 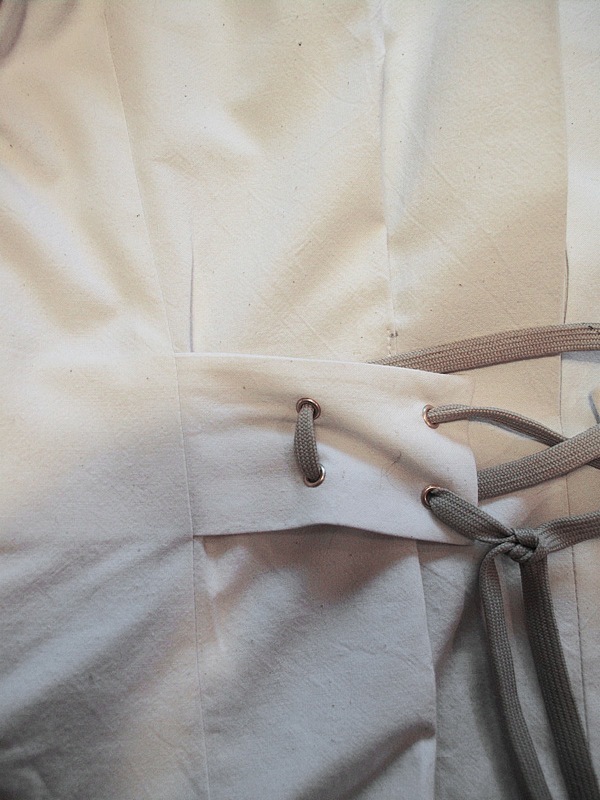 The last thing I need to do is attach the piping around the edges. This is done with a coarse jute webbing. It’s a bit awkward to work with, but once you get going it is’t so bad (see right). 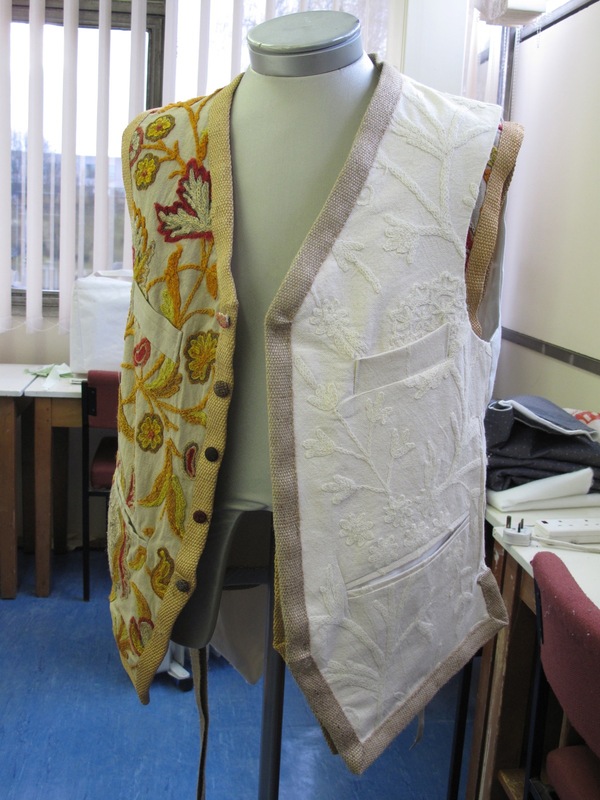 So far I’ve done one side of the front, and this gives me the chance to quickly put it up on a mannequin along with the original for a comparison (see below). Looking good, I think? I’ll finish off sewing the piping over Christmas – it gives me something constructive to do while watch the Queen’s speech and Doctor Who! Check back in the New Year to see the finished calico test.